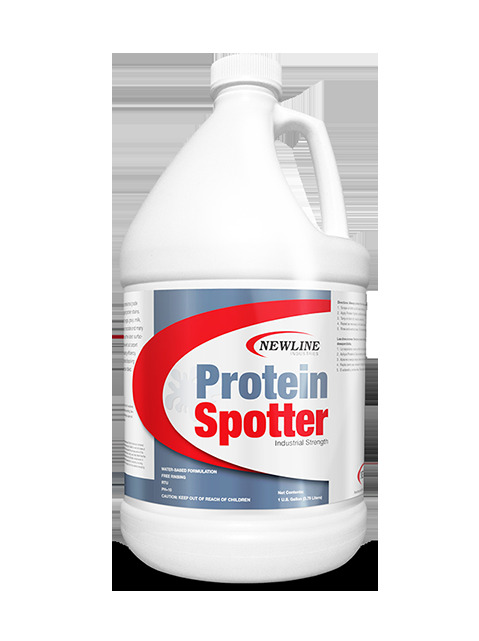 Protein Spotter is a professional grade spotter designed for removing the toughest protein stains. Protein Spotter removes stains caused by eggs, gravy, milk, baby formula, cheese sauce, ice cream, chocolate and many more. Protein Spotter by Newline uses the latest surfactant technology to quickly and effectively wet out carpet fibers and carpet backing to ensure cleaning efficiency. Protein Spotter’s powerful protein dissolving surfactant package excels where others cleaning products failed! Directions for use: Scrape or blot up all loose surface soil. Apply full strength to area to be cleaned. For heavily soiled areas, blot the product in with a clean towel or tamp with a brush. Repeat as necessary until desired spot removal is achieved. Rinse and extract.